A new entity – Enviro Copper Ltd – is being set up to develop a portfolio of opportunities for the in-situ recovery (ISR) of copper across Australia, starting with the Kapunda Copper Project and the Moonta Copper Project. 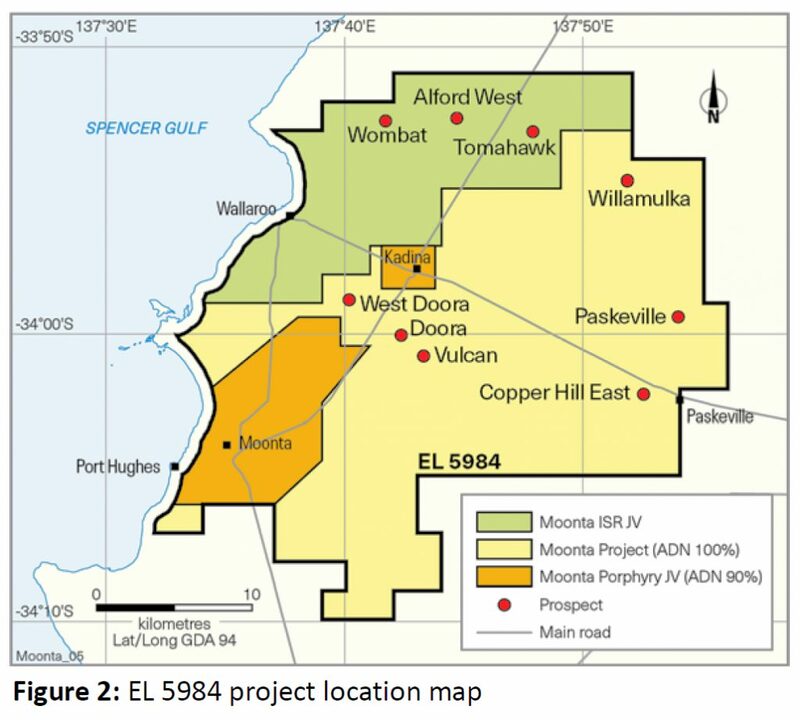 The Moonta Project ‘target’ area covers the northern section of Exploration Licence 5984 held by Andromeda Metals (previously Adelaide Resources). The Kapunda Copper Project ’target’ covers an area in and around the historic Kapunda Mine workings located near the town. 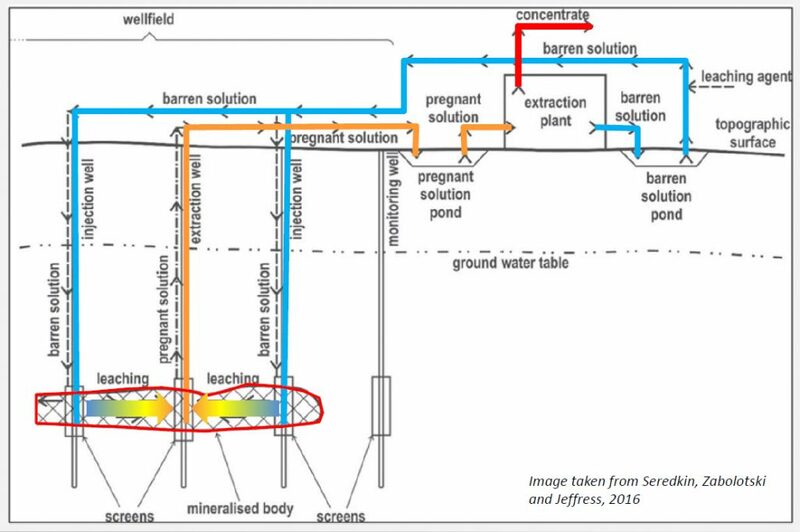 The in-situ recovery process (also referred to as in-situ leaching) involves injecting an acidic or alkaline solution into a mineralised zone via a borehole. The solution passes through the deposit, leaching the target metal, and is returned to the surface – via a second bore – to a processing plant where the dissolved metal is extracted. Although used fairly extensively in uranium mining, it seems ISR copper recovery has not previously been applied in Australia and is still relatively new in other countries. As a result, little data may be available on potential long-term environmental and other risks associated with copper extraction. However, Australian interest in this technique is growing because it offers a relatively cheap way of extracting copper from low grade deposits that cannot be economically mined via traditional open-cut or underground mining methods. Based on the limited information so far released by the proponents, YPLOG has identified a number of preliminary concerns re the application of this process at the Moonta site (see detailed discussion below). Whether or to what extent these will be addressed by the proponents as their feasibility work progresses remains to be seen. We stress that, at this stage,there is no imminent risk of this process being applied at the Moonta Project. Enviro-Copper Pty Ltd will concentrate its initial activities on its Kapunda site before seeking to apply this ISR process to the Moonta site. Since Kapunda will be the first “cab off the rank”, YPLOG will closely monitor the progress of that project while accumulating more research-based knowledge on the use of this technique for copper recovery in countries such as the US. For a more detailed discussion of this project, please read on……………. In March 2019, Thor Mining (ASX Code “THR”, 6 March 2019) announced it had entered into an MOU with several other companies to establish a new entity – Enviro Copper Ltd – which would aim to develop a portfolio of opportunities for the in-situ recovery (ISR) of copper in South Australia and Australia as a whole. The Kapunda Copper Project and the Moonta Copper Project have been selected as the initial focus for this work. The Moonta Project “target” area is shaded in green in Diagram 1 below and includes relatively recent copper discoveries in the Wombat and Tomahawk Zones. The Kapunda Copper Project “target” is focused on the historic Kapunda Mine (see below) and sits within Terramin’s Exploration Licence 5626. The owner of the mine site, the Light Regional Council, gave approval for the proponents to conduct preliminary investigative work in February 2017 (www.envirocopper.com.au/kapunda-isr-project). Moonta Project not likely to commence any time soon (if at all). The proponents will concentrate initially on demonstrating the operational viability of ISR by bringing the Kapunda Project into production. 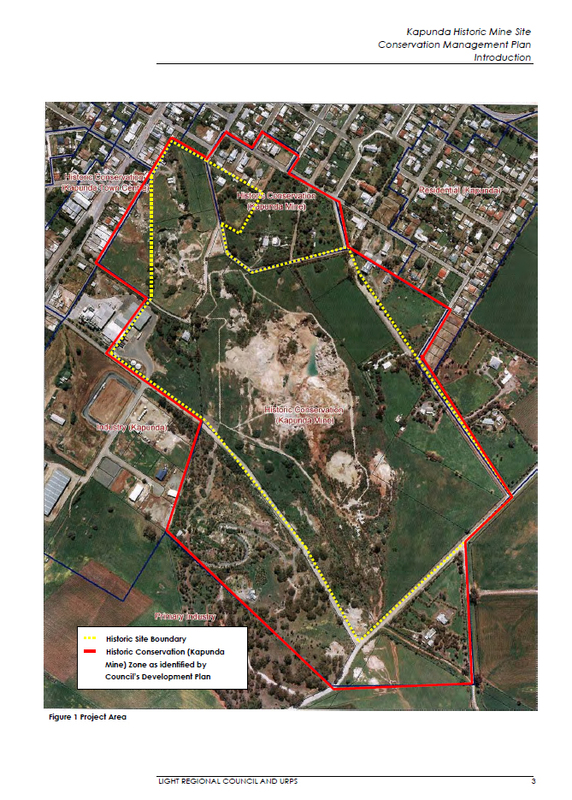 They will then seek to apply the process to the Moonta site. Thor Mining (ASX, p1, 6 March 2019) acknowledges there has been ”insufficient exploration at the Moonta site to define a Mineral Resource and it is uncertain if further exploration will result in the determination of a Mineral Resource”. Clearly the proponents still have a lot of work ahead of them. However, this technology is now firmly on the agenda of the Federal Government and copper miners. As evidence of this, the Federal Government has granted $2.8m over 2.5 years to a consortium – involving the mining proponents, the University of Adelaide and CSIRO – to assess the feasibility of this technique for copper extraction and address environmental concerns (Environmental Copper Recovery, paper delivered at SA Exploration and Mining Conference, Dec 2018 Adelaide). The purpose of this YPLOG email is to alert local farmers and the community that this technique is now being assessed for possible future roll-out in our region and to allow time for us to do the research needed to understand and respond to the potential risks involved. Fore-warned is fore-armed! What is In-Situ Recovery (also known as in-situ leaching or ISL)? “In-situ recovery is a production process used to recover minerals using a fluid circulated via drilled wells. During the process a leaching solution (or “lixiviant”) is injected into the mineralisation via a borehole, passes through the deposit leaching the target commodity, and is returned to the surface via a second bore where the dissolved metal is extracted from solution by SXEW or ion exchange in a processing plant” (Andromeda Metals, ASX Announcement, 19th December 2019) – see diagram below. While this process has been used fairly extensively in uranium mining, we understand its application to copper recovery is still relatively new. This raises concerns that a full understanding of the potential long-term environmental and other risks and how these may vary from one hydro-geological setting to another is yet to be derived. So far, the amount of data released by the proponents is very limited. However, YPLOG’s preliminary assessment of that data has identified a number of potential concerns (see below) re the application of ISR to copper recovery at the Moonta site. Far more investigation will be required by the proponents to address these concerns. The in-situ leaching process is not a simple chemical method of copper extraction. It relies on pumping acidic (or alkali) chemical cocktails down into the deposit, dissolving the metals and extracting the leachate. It then requires processing, which generates waste products, and also requires considerable quantities of water. The application of new bio-degradable lixiviant systems (including glycine and thiosulphate) is not mentioned at this stage for the Moonta project. How benign these chemicals are in the environment is still not clearly known. “..the hydrogeology of the deposit is of critical importance both for mining and environmental protection” (CSIRO; Review of Environmental Impacts of the Acid In-situ Leach Uranium Mining Process; Taylor, et al, 2004).However, the information so far provided by the proponents regarding the geology and hydrogeology of the Moonta ISR target area is very limited. There is no evidence that the strata within the target areas (Tomahawk or Bruce Zones) are well understood. Andromeda Metals (ASX Announcement, 19Dec 2018) refer to the use of ISR at the Beverley Uranium Mine. However, we understand that the geology at Beverley is relatively simple and is composed of layer cake strata with the uranium roll front deposit confined by extensive clay units, making this an ideal hydro-geologic setting for ISL. In contrast, the details released by the proponents indicate the Wombat deposit near Alford resides in a complex, deeply weathered fracture zone that lacks a simple layered structure. The fracture zone is composed of inhomogeneous rock decomposition with the development of a melange of disconnected clay lenses and partly decomposed metamorphic rocks (drill holes WOM001, WOM002 – THOR, ASX, 6 March 2019: DEM Open File Envelop 9285, Annual Reports 1996-2008). This does not appear to be an ideal setting for an ISL operation and introduces serious engineering challenges. New barrier technologies requiring the introduction of polymers, colloidal-silica grouts and bio-cements into the subsurface to control fluid flow should be viewed sceptically at this stage. The drill hole descriptions at Wombat suggest there will be no contiguous laterally confining clay layers and that the mineralised material is not confined to a simple porous-permeable layer. The copper deposit has not formed as a result of precipitation from fluids migrating through an aquifer (Beverley type) but by hydrothermal solutions migrating via a network for complex fluid conduits not constrained to a particular horizon. The biggest issue is keeping the ISL system closed. If this fails, there is major potential for subsurface contamination, with dispersal of chemicals outwards from the mine area. At this stage there is no evidence that simple aquifers with confining aquitards exist at this site (Alford area). Fluid pathways will potentially be complex and unpredictable. As such, the proper control of mining solutions and waste water within the mined zones may be problematic. Leakage of mining fluids into surrounding rocks may be very difficult to control, with such fluids perhaps finding their way to undesirable locations. The recovery of copper and gold from the deposit will require either acidic or alkali solutions which will also take up other compounds including those of arsenic and heavy metals. These become problematic in the processing plant and need to be disposed of. A number of undesirable compounds will be removed from the leachate, raising the question of where they will go. Is re-injection into the ground the likely method? Techniques used to clean up the waste solutions is a significant problem and can take a long time. The proponents have not qualified their assertion that the quality of ground water at this location is unsuitable for agriculture or livestock. Detailed ground water analysis data have not been released for public scrutiny. Number of injection and recovery wells required: According to THOR (ASX, 6 March 2019, p. 2), ISR copper recovery “has the potential to co-exist without significant disruption to farming…” However, the size of the recovery processing plant and the number of injection and recovery wells that may be needed have yet to be ascertained. On the surface the deposit could potentially be covered by wells every 10 to 60m. 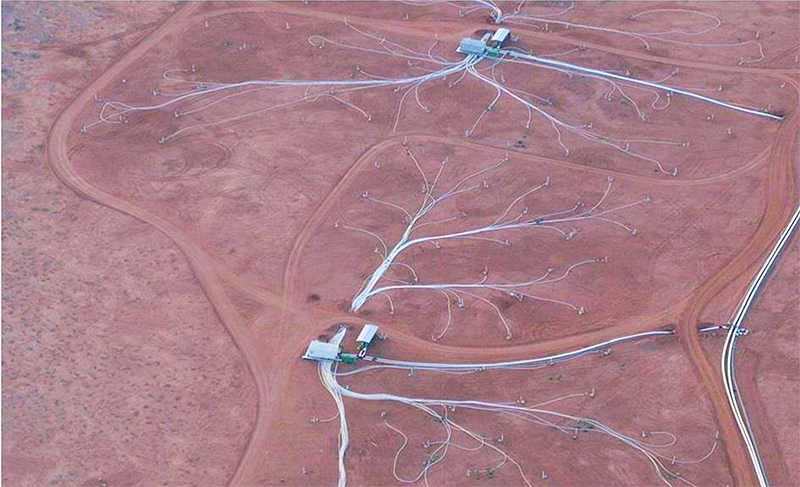 The photo below, showing the ISR well field at the Beverley Uranium Mine in northern SA, suggests the impact on agriculture may be more extensive than anticipated. As noted earlier, the proponents’ task of assessing the environmental safety of ISR Copper Recovery firstly at the Kapunda site, and subsequently at the Moonta site has a long way to go. Given that Kapunda will be the first “cab off the rank”, YPLOG will closely monitor the progress of that project while accumulating more research-based knowledge on the use of this technique in countries such as the US. The most critical documentation to access and review is any hydrogeological modelling reports and environmental baseline reviews done by independent consultants.